Wow! 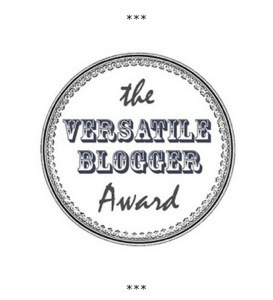 Another Versatile Bloggers Award! I would like to thank http://cjswriting.wordpress.com/ for nominating me. When you get a chance please stop by and check out this awesome blog. 1. If you have been nominated create a post to thank that person. Link your post back to their blog. 2. Nominate 10 other bloggers that you believe deserve this award. Link back to their blog. Notify them to let them know of the nomination. *Please know that accepting is voluntary. 1. I am very afraid of thunder and lightning storms. 2. I am allergic to dust mites. 3. I did not get my driver’s license until I was 25 years old. 4. Many years ago I completed a 16 week data entry training program in 12 weeks. 5. My middle name is Ann. 7. I have a rare condition called Plantar Fibromatosis. This entry was posted in All, Blogger Awards and tagged blogging awards, Versatile Bloggers Award. Bookmark the permalink. Thank you! Haven’t had your coffee yet…lol I understood what you meant. Have a great day!